Games help youth ministry groups and Sunday school classes interact with one another and learn about the Bible. When choosing games for your youth group, you want to choose games that are appropriate for the size of your group and allow all members to participate. These games will help the youth in your group expand their Bible knowledge in dramatic, energetic ways. To help youth learn memory verses, place them in small groups and challenge each group to come up with a creative way to remember an assigned memory verse. They may choose to create hand gestures or body motions to represent the different words of the verse, or set the verse to the tune of another popular song and perform it for the group. Play a game of charades using popular Bible stories, characters or verses. Place the titles of the stories, verses or character names on slips of paper. One by one, have youth come up and pick a slip of paper from a bag. Players must act out what is written on the slip without using any words in an attempt to get their teammates to guess the verse, Bible story or character. For example, a player may mimic rowing a boat to represent Noah or pretend to catch fish to represent Matthew 4:19, "And he said to them, 'Follow me, and I will make you fishers of men" (NASB). After reading a passage of the Bible with your youth group, place youth into small groups and have them come up with a short skit to represent the theme of the passage. The goal of this game is to get the youth to make a modern connection to the stories of the Bible. Write the names of famous pairs in the Bible on index cards. Tape an index card on the back of each member of the youth group. Youth must walk around the room asking "yes" or "no" questions to determine what is written on the index card, then find their matches. Some Biblical pairs include Adam and Eve, Mary and Joseph, Sodom and Gomorrah, David and Goliath and Jonah and the whale. Part of youth ministry is to build youth up and help them feel accepted. Teamwork games require youth to work together to experience success, building their trust in one another and confidence in themselves. A simple game of kickball will allow youth to interact with one another and work as a team without requiring a lot of technical skill. Make the game more entertaining by using an oversized ball or introducing silly rules, such as requiring players to hop between the bases or only throw the ball with their left hand. Divide members of the youth group into teams of five or six. Give each group a large blanket or bedspread. 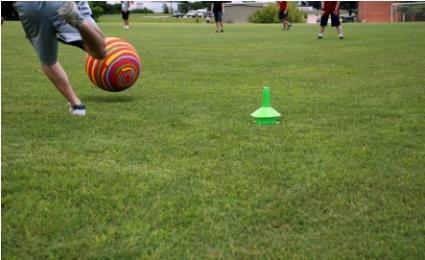 Create a wide course using plastic cones on the grass or a tile floor. Each group must pull all members of their group on the blanket through the course in the least amount of time. Because each member of the group must sit on the blanket at least once, it will require at least two trips through the course. For example, a group may have one member pull the five lightest members on the blanket through the course, then have the five lightest members pull the heaviest member through the course. Create a list of items for teams of two to three youth to find or tasks for them to complete. You may hold the scavenger hunt in your church and have the youth find specific items within the building or meet at a local mall or large discount store and challenge the youth to be the first team to spend $1,000 or cross of the most items on a list in a set amount of time. The Source for Youth Ministry offers a list of games and icebreakers for youth ministries. Games are organized into categories such as Anywhere Games, Audience Games and Games with a Point. Many of the games have been rated by users and allow users to submit their own variations of the game. Onion Rings Studios, created by a youth pastor in Columbia, South Carolina, features a large list of youth ministry games that the pastor has used with his own youth group. Games are organized alphabetically by title. The website features multiple types of games, from icebreakers to team and trivia games. EGAD! Ideas organizes its large collection of youth group games by categories such as indoor games, outdoor games and scavenger hunts. Within the categories, games may be sorted by title and rating. Choose games for your youth group based on the specific games you have within your youth group and the agenda you hope to accomplish. Icebreaker and teamwork games work well for youth groups where the youth do not know each other very well or need a boost of confidence. Biblical games and skits work best for groups where you want the focus to remain on the Bible and its principles.